Bee becomes a damsel. (What? Really?) 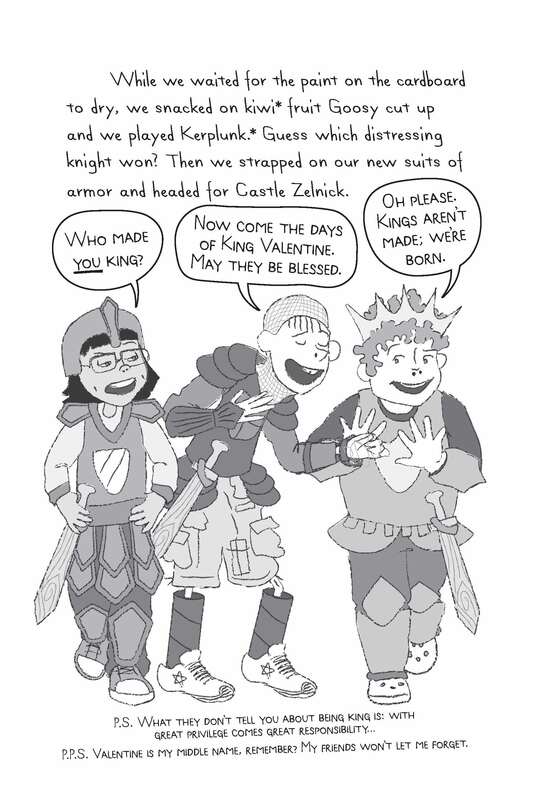 Correction: Bee will not be a damsel, because, as she tells the boys, she is not in distress Kerfuffle, (a disturbance or fuss), continually confronts the three knights. Oddly, the big ado involves a band called Kerfuffle, a baked sale interrupted by a seemingly vicious stray, and a large amount of missing money. Aldo becomes the prime suspect accused by the black knight. To add to Aldo’s problems, the black night his brother Timothy’s new friend. As in books A, B, C, D, E, F, G, H, I*, and J Kerfuffle humorously engages readers. There is enough text to keep the story humming along, but not so much as to crowd out Aldo’s wonderful illustrations, which greatly enhance the story. Kids will love the black and white “doodles,” especially Aldo’s comic series “Bacon Boy.” Middle grade kids—reluctant readers included—will love this series. The characters are believable, multi-dimensional, likable, and in many ways familiar to everyday life. Well-written characters will stick with you long after the last page is turned. Aldo, Jack, and Bee are those types of characters. Reluctant readers will appreciate the short chapters. 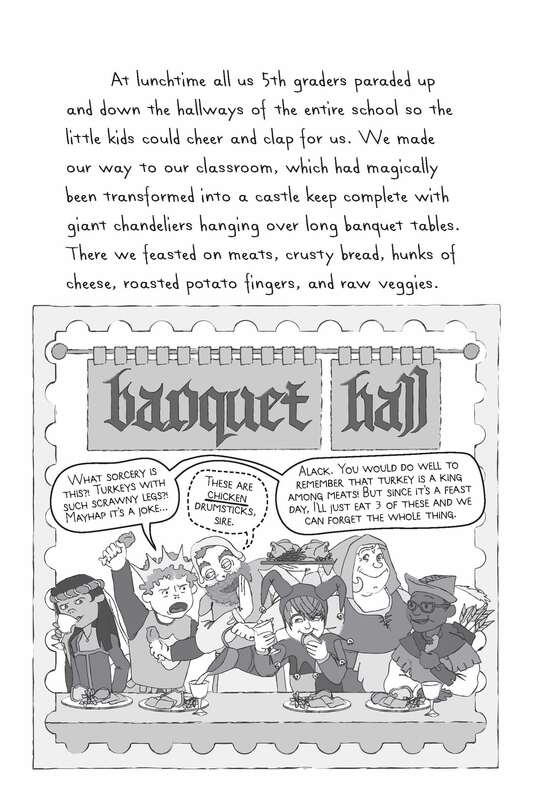 Kerfuffle is the eleventh book in Aldo’s series, which is similar to The Wimpy Kid, although Kerfuffle’s detailed illustrations contribute more to the overall story. Aldo Zelnick books introduce new words beginning with the title’s first letter. Kerfuffle, then, has words beginning with the letter “K.” Examples include kaleidoscope, killjoy, kvetching, and kohlrabi. The glossary defines each “K” word (highlighted in the story with an asterisk). I wrote in a previous review that kids would laugh their hinnies off, no external exercise needed. This remains true. Each Aldo Zelnick edition stands on its own, so start the series with Kerfuffle and work backwards, if you are so inclined. If You Believe, Click Image to See The E. B. in Action. 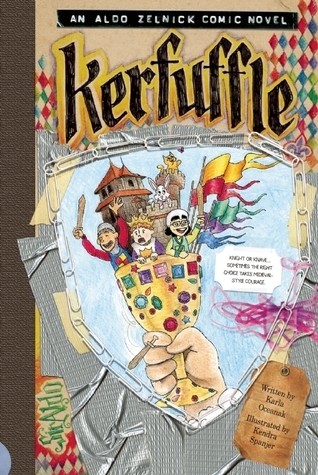 KERFUFFLE: AN ALDO ZELNICK COMIC NOVEL (#11). Text copyright © 2015 by by Karla Oceanak. Illustrations copyright © 2015 by Kendra Spanjer. Reproduced by permission of the publisher, Bailiwick Press, Fort Collins, CO.
Purchase Kerfuffle at Amazon —Book Depository—IndieBound Books—Bailiwick Press. Learn more about Kerfuffle HERE. JOIN THE FAN CLUB HERE. KERFUFFLE: AN ALDO ZELNICK COMIC NOVEL (#11). Illustrations copyright © 2015 by Kendra Spanjer. Used by permission of Bailiwick Press.